Last month I wrote about the different methods of drying and pressing flowers and I touched on some crafts that you can do with preserved flowers. This month I will share more ideas on how to use dried and pressed flowers to make spring and summer last all year. There are so many ways that you can use preserved flowers in your home that it is difficult to cover them all, but here are a few ideas to get you started. 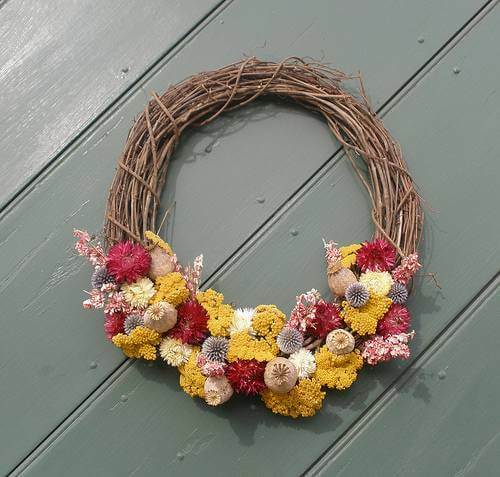 Using dried flowers to create everlasting dried flower arrangements is probably what first comes to your mind when you think of dried flowers, but think outside the box: weave or hot glue dried flowers to a grapevine wreath or use an interesting container, such as a hollowed out pumpkin, to place your dry flower arrangements. Half baskets with a flat back that are made of wicker or metal look great stuffed with dried flowers and are easily hung on the wall. Personally, I like to use cake pedestals with dried flowers such as roses or sunflowers scattered on top as a table centerpiece. Pressed flowers and foliage can be arranged into beautiful scenes and placed in frames. You will want to arrange the flowers and foliage first without glue to know what looks best. When you have them the way you want them, use tweezers to hold each delicate flower while applying tiny dots of white glue to the back with a toothpick. Press them into place on the paper; layering gives a realistic appearance. Slide into the frame and enjoy. You can also apply the flowers directly onto the back of a glass frame for a sun catcher effect, but the sun will eventually fade the colors of your dry flower arrangements. I like to keep a stash of pressed flower cards that I have made on hand. My friends and family love them and I have even seen them framed! I use cardstock that I buy from craft stores-you can get any color and texture. I simply fold the cardstock piece in half to make a card and start decorating. I lay out my arrangement then glue it as described in the section above. 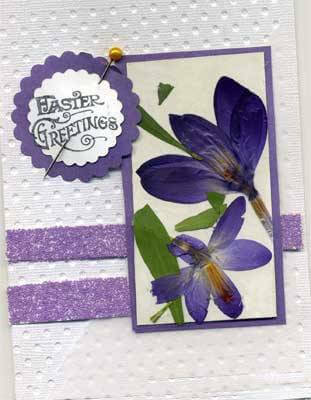 I often use other embellishments or scrapbook papers to further decorate my cards. Placemats and Bookmarks are easily made out of pressed flowers simply by laminating. Glue dried pressed flowers onto a piece of paper or cardstock and laminate to make placemats, bookmarks, ornaments, or scrapbook pages. The possibilities are endless. I personally use clear contact paper or laminating pouches to make these crafts instead of laminating them, since I don’t have a laminator at home. What a great way to remember spring! 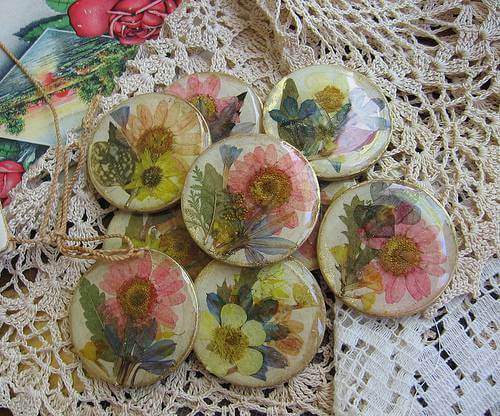 Dried flowers can be used to decoupage wood, cardboard, glass, candles, and more. Dried pressed flowers are beautiful decoupaged onto clear glass bottles and votive holders. Simply glue the flowers onto the bottles then brush over with Mod Podge or glue that has been thinned down with water. You can also use varnish or shellac. These bottles look amazing with the light shining through them. 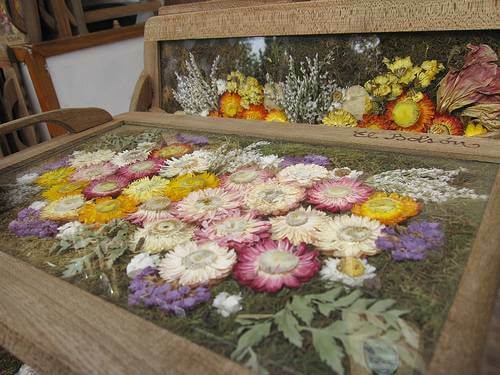 Wooden and cardboard trinket boxes can be bought at craft stores and turned into objects of beauty with pressed flowers. I have given away many of these for holiday and birthday gifts. A simple way to make a pressed flower pendant is to glue a piece of paper into a bezel pendant, affix a pressed flower with glue, and then cover with an epoxy dot cut to the appropriate size. Bezel pendants and epoxy dots can be found at craft stores. You can find rings and earrings with bezel sets as well. If you are adventurous and willing to try something more difficult, you can buy a kit to mix resin and embed your flowers in resin. I have occasionally found pendants that are comprised of two pieces of glass held together by a decorative metal ring-I just slide dried flowers between the pieces of glass to make a gorgeous necklace. As you can see, there are many ways to remember a special bouquet or garden. With these craft and decorating ideas, bouquets can last a lifetime. Spring really can last all year.